Cecilia, is currently pursuing a degree in Music Education at Pacific Lutheran University in Tacoma, WA. Cecilia has an immense passion for music, theatre, and working with kids! She is an active performer in the greater Tacoma/Seattle area. 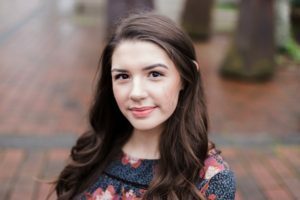 Furthermore, she has been seen at Tacoma Musical Playhouse, Tacoma Little Theatre, Pacific Lutheran University, Seattle Opera, and much more! Some of her most recent credits include Belle in “Beauty and the Beast”, Rosalind in “Love’s Labour’s Lost”, and Jo March in “Little Women” in which she won the 5th Avenue Award for a small ensemble; March Sisters. It has always been Cecilia’s dream to be a princess, and she hopes to bring magic and joy to your next party! To book Cecilia for your Tacoma Princess Party, Lynwood, Kirkland, Tacoma and Surrounding Areas be sure to call us at 206-258-6790 ext. 1 or email us at info@amazingfairytaleparties.com.